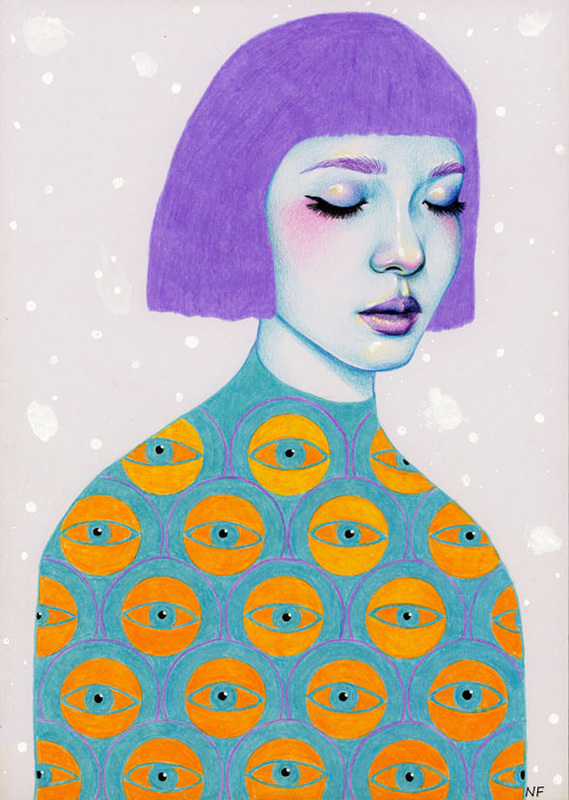 Natalie Foss in a Norweigan illustrator and this year she did her own exhibition in Shang Hai. This work is called "Addiction" and the fire of the lighter is expressed as a heart. This art work is called "Floating"
She gave the feeling as if the preson in the drawing is floating on the water. in addition, her artworks are created in many different art formed stuff. For example, this illustration was made into a bed sheet. Other than this, she does a lot of collaboration with art magazine as a illustration. Looking through all her works, i realised that she uses 'blue' as the skin tone and i am inspired by how she expresses her way like that. For her art she, mostly uses colour pencil. I feel her colour technique also gives crayon feel on her work too.